I need players with passion, dedication, experience and decent gear. The music style is varied – Blues, Rock, Swing and more. Soy Cantor/Guitarrista/Compositor con mucha experiencia, y estoy buscando una Sección Sólida de Ritmo, Bajo y Batería. Necesito tocadores con pasión, dedicación, experiencia, y su própio equipo de calidad. Varios modos de música, pero con énfasis en Blues, Rock y Swing. 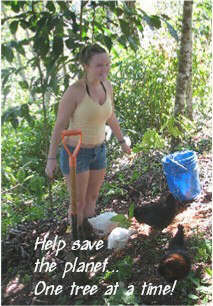 I split my time between my home in Newburyport, Massachusetts, and my 25 acre farm, Finca Las Colinitas in Costa Rica. Now here's the best part.....because I'm not there all the time, the farm is often available as a vacation rental! 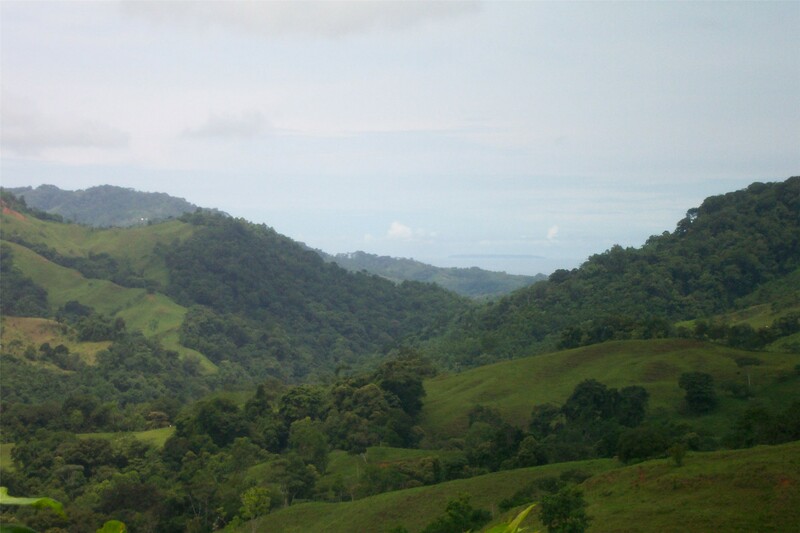 Finca Las Colinitas is set in a very rural area of the country, near the Southern Pacific coast. If you're a birdwatcher (without the need of a catered tour), this place is fabulous. If you need a peaceful and quiet tropical getaway, this is ideal. 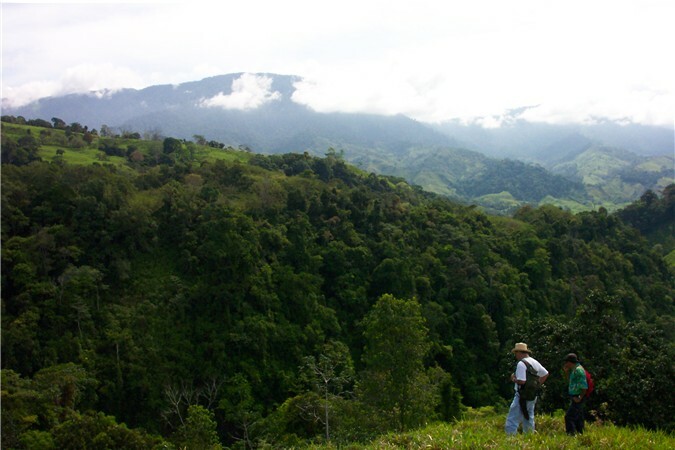 If you want to hike, ride horses, study nature, help to save Costa Rican rainforests, then you can't get much better than this. 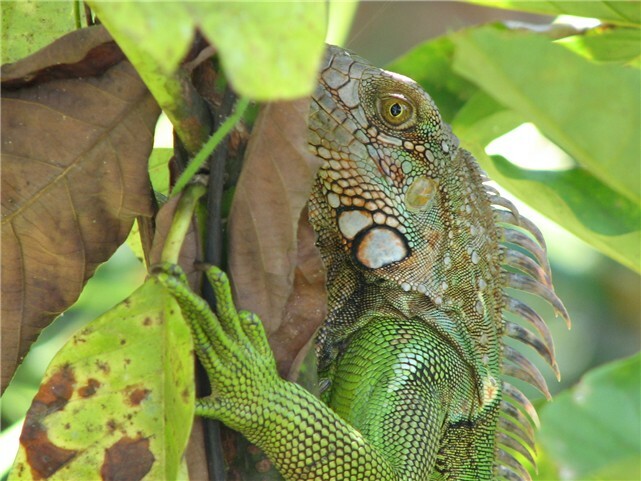 If you want to learn something about the rural culture of Costa Rica, improve your Spanish, write your novel, compose your song, or for just a little while really relax, then you will love my finca! On the other hand, if you need a place with an active nightlife, plenty of stores, a variety of restaurants, where you are as likely to hear English spoken as you are to hear Spanish, where you can spend all day lounging on the beach.......well, the beach town of Dominical, well-known to surfers around the world, is a 40 minute drive, and the growing city of San Isidro is an hour's drive. The cost? Only $200 US per week! That includes electricity, indoor plumbing (including wonderfully fresh mountain spring water), linens, kitchen supplies/appliances, washer and dryer. Below are a few photos. Click on them to enlarge. Enjoy! Pura Vida! Ask for more info. 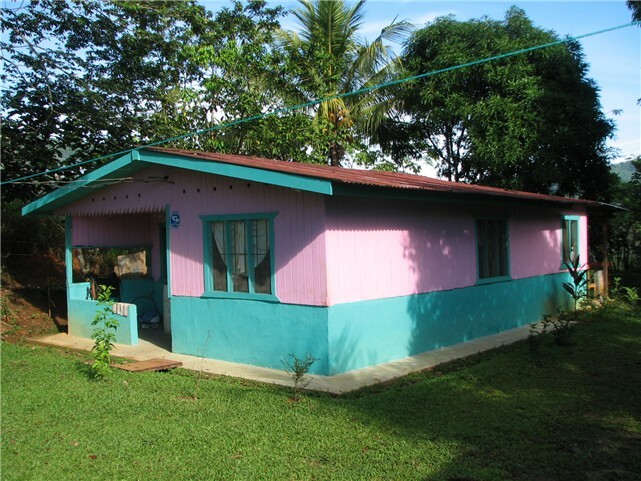 The accomodations are in a small, but lovingly restored typical rural Costa Rican house. Kitchen (frig, sink, gas cooker), bath (yes, there's running water), living room, 2 bedrooms (one moderately large, the other quite small), laundry/store area, front and back veranda. This is the living room. 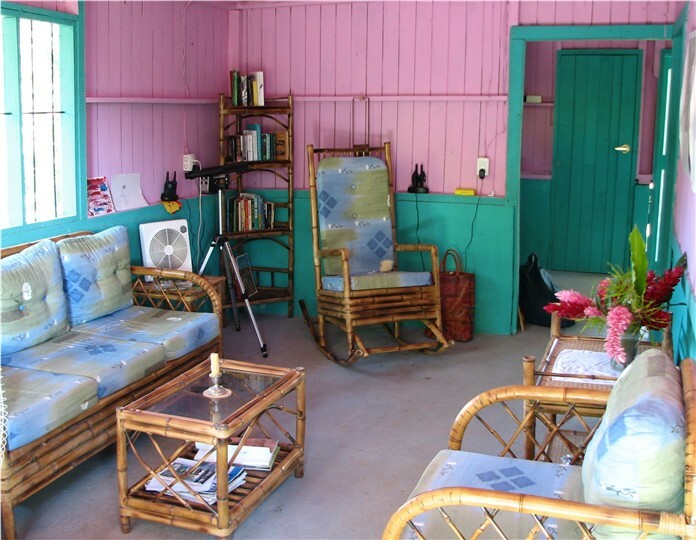 Most of the furniture is from a nearby bamboo manufacturer. 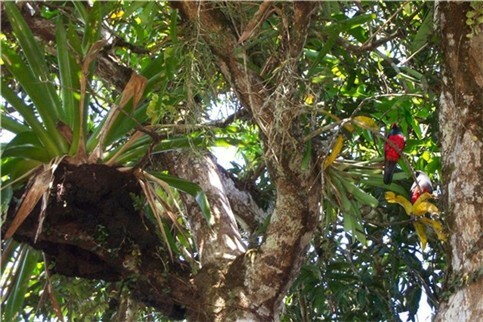 While sitting on the back veranda one morning, sipping on our local grown coffee, we spotted this pair of trogans in the mango tree, feeding on the termite nest (left - out of which is growing a bromeliad)! 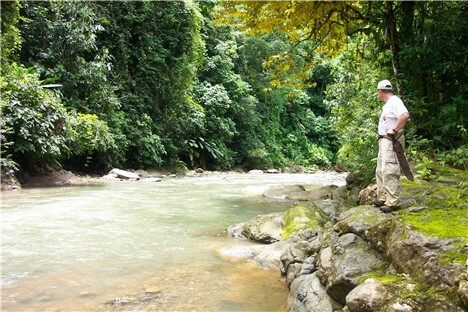 ....Now just turn to your left, and you're looking downriver, across the beautiful Guabo Valley. The pastures at the top of the property give way to tropical forest as you head down to the 1800 ft of frontage along the Rio Moreno. 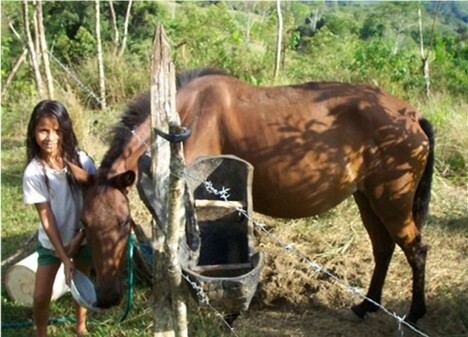 That's our lovely neighbor Carolina, giving a molasses treat to our (then pregnant) mare Tonka. Easy to ride! 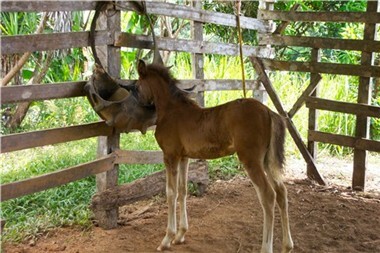 The new filly's name is "Sorpresa". 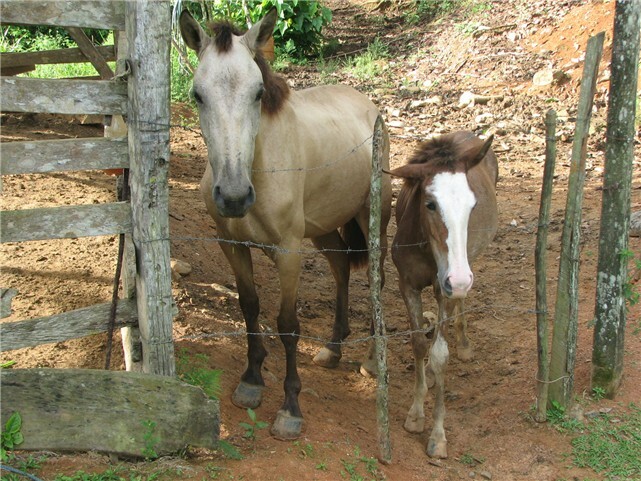 Sorpresa with her big sister, Violeta. 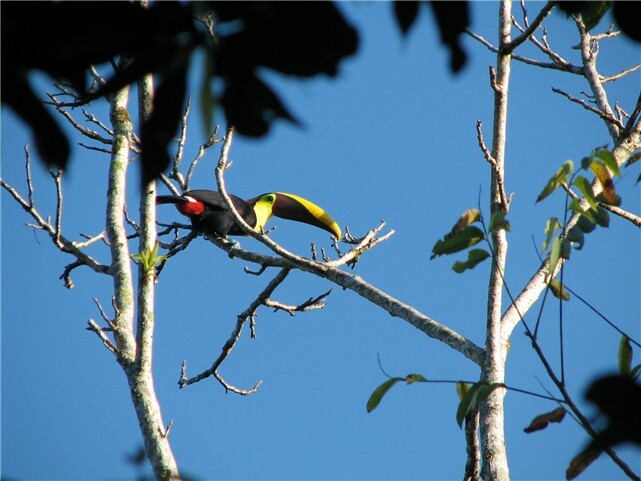 This Toucan was in clear view from the house. That's not unusual. A little more unusual is that there is only one - they are usually seen in pairs. This guy's family has obviously been residing on this property for a long long time. 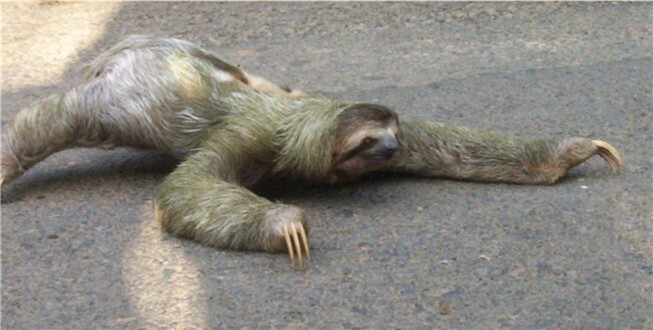 Take the time to ponder some of the world's most elusive philosophical questions, such as "Why did the three-toed sloth cross the road?"